the upstairs at nick's pub! 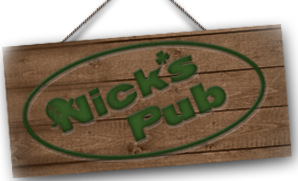 Join us for private parties, holiday parties, or if you are just looking for some more entertainment, Nick's Pub has all kinds of games to keep you and your friends occupied. Our wide array of bar games includes Shuffle Board, Golden Tee, Foosball, Buck Hunter, Darts, Pool, Pinball, and more! Reserve our Game Room for private parties of 10 or more or rent the entire room up to 80 people. Check out our weekly specials before you book your event or contact us below to learn more. ROOM CHARGES ARE BASED UPON GROUP SIZE, IF LIQUOR PACKAGE IS PURCHASED, AND/OR GROUP SIZE. WE DO NOT ALLOW PEOPLE TO BRING FOOD IN, HOWEVER, IF YOU'D LIKE TO BRING YOU OWN DESERT, WE CHARGE $1 PER PERSON. IF YOU'D LIKE TO ADD OPTIONS NOT CURRENTLY LISTED, WE CAN PROVIDE CUSTOM PACKAGES FOR GROUP EVENTS. NICK'S PUB IS NOT RESPONSIBLE FOR COLLECTING MONEY FROM YOUR GROUP. WE REQUIRE A SECURITY DEPOSIT TO SECURE THE ROOM AND THE PERSON(S) WHO PLEDGE THE DEPOSIT IS RESPONSIBLE FOR PAYMENT - THANK YOU.